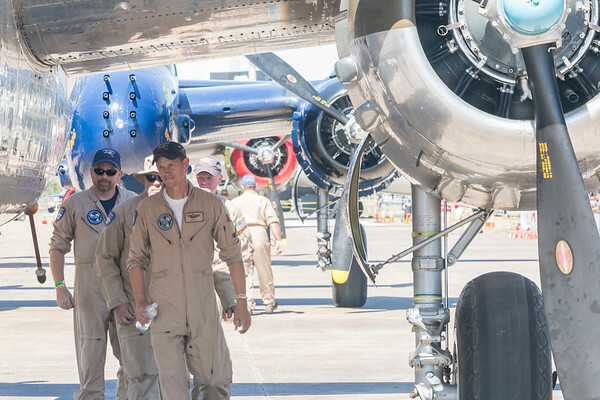 The Commemorative Air Force held it Wings Over Dallas World War Two Airshow October 6-8. Although the historic aircraft attract much attention, the main feature of this event is the WW II veterans. This airshow event focus on commemorating the sacrifices of our veterans and teaching their history to our younger generations. To accomplish this, WW II veterans share their experiences of valor and sacrifice while the historic aircraft and reenactor groups help make the history come alive. I am honored for the CAF to allow me to contribute my photography services to capture this event and to help promote the CAF and its mission. This is a very small sample of images from this event. Considering attending next year's event. Or better yet, join the CAF to help keep history alive! After given the order to launch, B-25 crews man their aircraft.